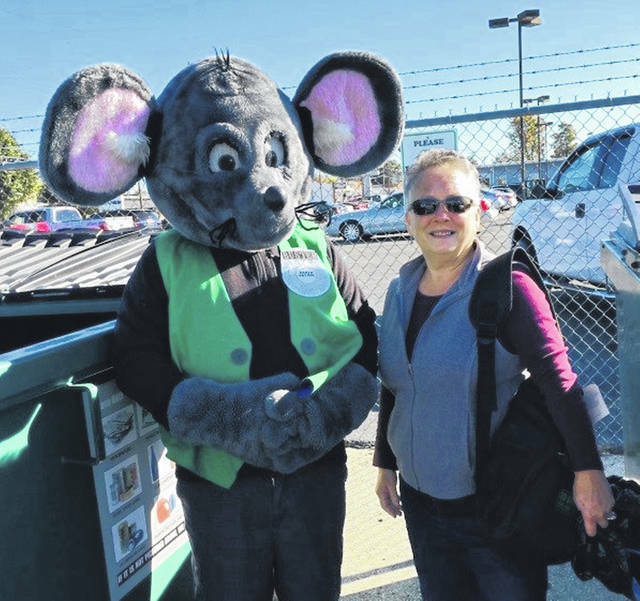 Jane Chafin is the fourth “Get Caught Recycling” winner as Buster the Mouse, from the Clinton County Solid Waste District, caught Jane “green-handed” putting the proper recyclables into the community drop-off recycling containers in Wilmington. For her efforts in practicing the 3Rs, Jane received several recycled-content prizes, such as a hammock, backpack, and other recycled-content products. Don’t miss out on this chance to win great prizes by simply recycling household items such as bottles, jars, and newspapers. For a list of the local recycling drop-off locations and acceptable materials, visit the SWMD’s website at www.co.clinton.oh.us/recycling. There is only one week left in the campaign, so be on the lookout … you could be the next person caught green-handed!